Coverage: Scrum V Live on BBC Two Wales and the BBC Sport website. 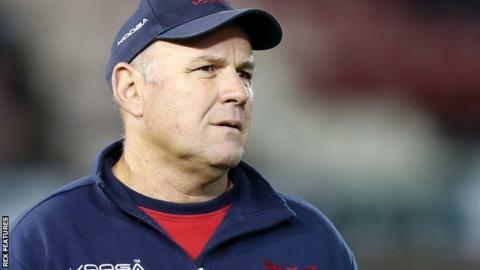 Scarlets coach Wayne Pivac says Boxing Day's derby against Ospreys will be of "huge significance" in the battle to finish as the leading Welsh region in the Pro12. Scarlets' open-side flanker John Barclay will return after two weeks out with a shoulder injury, while blindside Aaron Shingler is rated as 50-50. "One of our goals is to be the top Welsh region," Pivac said. "So that has huge significance if we can get the win." The Scarlets are top of the table with eight wins out of nine while the Ospreys have only four victories after a slow start. "It'll all be part of the motivation when you get these games," Pivac added. "You want to be the best Irish team, Scottish team or Welsh team." The west Wales region have been without a specialist open-side for most of the last two matches with injuries to Scotland international Barclay, James Davies (foot) and teenager Tom Phillips (concussion) forcing 21-year-old number eight Jack Condy to provide emergency cover. "Getting John back, a seasoned player and experienced player, brings a lot in terms of our defence as well as what he does in attack and at the breakdown," Pivac told BBC Wales Sport. "He's a good communicator and a good leader so we welcome him back." Pivac believes there is no significance to the lack of tries in Scarlets' 9-6 home defeat against Glasgow, compared to the eight on offer in Ospreys' 33-27 reverse in Bordeaux. "I think they are playing very well at the moment, trying a few things in good conditions and playing some good rugby," added the New Zealander. "They're going to be a big threat to us with some class players. "Dan Biggar is a class player and we're obviously aware of his abilities, but if you start targeting one player then it opens up for others. "We won't be setting any particular plan for Dan Biggar, but we're aware of his capabilities."